This detailed description was written by an anonymous person on the back of today’s Real Photo postcard lent by Shannon Hall. The concise words seem directed at someone who is already familiar with Rock Island but is elsewhere. With so much information, there is little need for additional research as we follow the writer’s words. “Here’s a new set of photo cards recently out (not mine—they are printed by machine).” This postcard was No. 5 in the set. It was not postmarked but was likely sent in an envelope along with other cards from the same set. The fact that they were printed by machine indicates that they were produced in commercial quantities for sale. Real Photo postcards could also be privately printed from personal photos. “This view looks northeast from the top of the Best Building.” The Best Building, which replaced the Buford Block on the northeast corner of 2nd Avenue and 17th Street, was not completed until 1909. Therefore the photo must date from after that time. The Best, which has a large contemporary mural of Black Hawk on its north side, is now known as the VanDerGinst Building. “You see the river, the arsenal at the right, the Government Bridge and Davenport at the left—also a near view of the rear of the Harms Hotel.” The Harms Hotel was completed in 1902, so these words do not offer a clue to the postcard’s date. However the unobstructed view of the 1896 double-decker bridge and the arsenal does give us a sense of the open feeling of the river in these early days. When the Armory and the lock and dam system were constructed in the 1930s, the view from downtown Rock Island changed a great deal. Later, the writer later says, “Note the sandbars at the foot of the arsenal—the river was very low last summer when this was taken.” The sandbars are probably the small light colored areas in the river on the right side of the picture. When water levels changed after dam was built just downstream from the bridge, those sandbars became much more prominent – large enough to enclose a pond and to support the large wooded areas that hide the cliffs and caves of the island from view. But in these early years, the steep river bank in front of the Clock Tower Building is easily discerned. “The ferry Augusta (renamed Rock Island) is lying at its dock in the lower left hand.” This simple statement turned out to be quite confusing, since there were three different ferryboats named the Rock Island. There was also an inclination for ferry owners to change boat names frequently. Sifting through historic news clippings at the Rock Island County Historical Society led to the following arguable scenario. The Augusta, a sidewheeler, was built in Clinton, Iowa, in 1875 and operated as the ferry between Clinton and Garden Plain, Illinois. It was no longer needed after the bridge was built there, so it was sold to Rock Island interests, where it operated as the ferry between Rock Island and Davenport. This service began in 1894, when the bell from the previous ferry J. W. Spencer was transferred to the Augusta. In 1902, the Augusta was rebuilt and renamed, the T. J. Robinson. In 1904, the larger sternwheeler ferry, Davenport, was launched and it was decided to change the name of the T.J. Robinson (formerly the Augusta) to Rock Island so that “no favoritism would be shown.” Both ferries were used at that time, although it later two proved uneconomical, so only the Davenport was used. 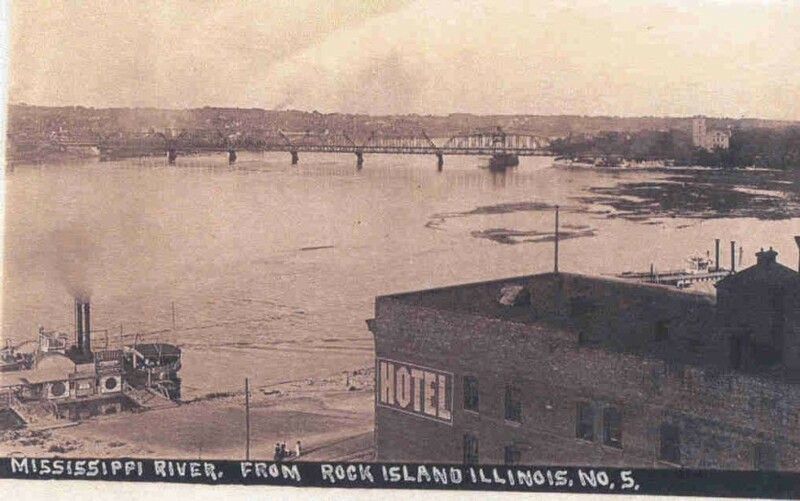 Another account says the Rock Island was used for 13 years before being sold, although the Argus also reported, in March of 1918, that the “old” ferryboat Rock Island would be used while ice was floating in the river. After the ice was gone, the “new” and larger ferry Davenport would take its place. “Did you read of the accident to the Vesuvius, of which I sent you a photo?” No information that relates to this cryptic statement could be found. Surely the Vesuvius must have been a steamboat – what an appropriate name, with the smoke constantly emanating from its stacks – but there is no verification of the name or an accident in this era. Perhaps it was a brand name for some mechanical item, or a local company. Still no luck. Readers – what could it be? This article by Diane Oestreich is slightly modified from the original, which appeared in the Rock Island Argus and Moline Dispatch on April 20, 2003.